Voters in the Nov. 6 general election will have a chance to choose two candidates from a slate of four on the ballot to serve in two open Sartell City Council seats. Those two positions are now served by Ryan Fitzthum and David Peterson, both of whom are vying for the mayoral spot in the election. 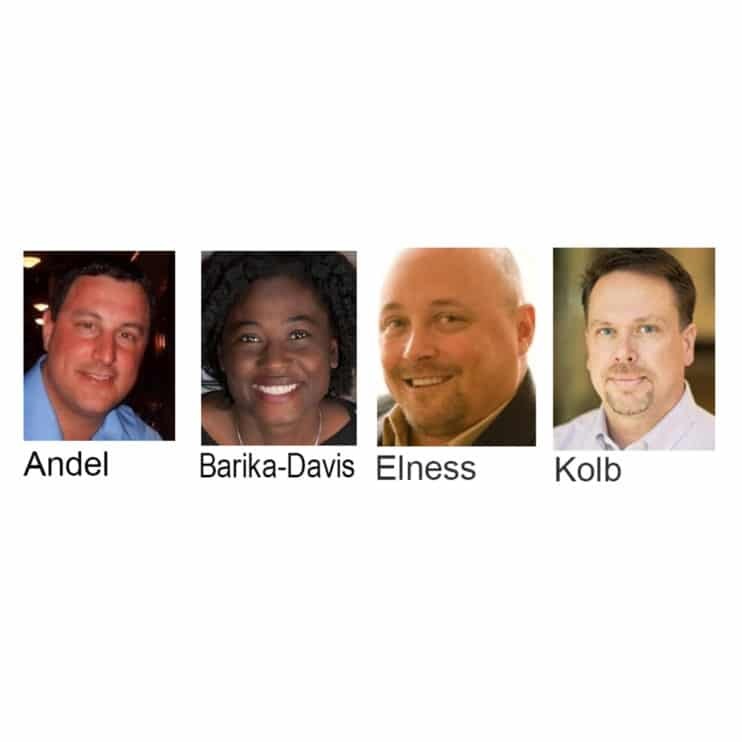 The council candidates are Brady Andel, Barika Davis, Tim Elness and Jeff Kolb. None of them has served previously on the council. The salary for a council member is $433.33 per month, with no per diems paid and no pay for extra meetings. Brady Andel, 41, is an agency owner for Amstrong Transport Group, a logistics company. He and Jill have been married for 17 years and have two children: Brooke, 15, a Sartell High School student; and Carson, a sixth-grader at Sartell Middle School. Brooke is on the Sartell dance team and a member of the Sartell varsity golf team. Carson is involved in football, hockey and loves to spend his summers golfing, playing hockey and lake-fishing. Jill is the director of the University Honors Program at St. Cloud State University. Raised in Foley with parents, a sister and brother, Andel graduated from Foley High School, attended the University of Minnesota, Morris, for three years and played basketball there. He then transferred to St. Cloud State and he graduated with a bachelor’s degree in business. He and Jill have lived in Sartell for 17 years. Andel has had 14 years of experience in the transport logistics industry. He is a volunteer youth coach, a Salvation Army volunteer and a member of St. Francis Xavier Church. The biggest challenge for the city is how to pay for everything, Andel said. To do that, the city must attract commercial business development by having a tax cost that is business-friendly. Andel is very pleased with the community center. Andel described Sartell taxes as in line, compared with taxes in the surrounding cities. But, again, he stressed the need to attract more commercial businesses to keep taxes as low as possible. Andel strongly favors the river as a city asset. Andel supports a history museum, preferably in an existing building that could be repurposed. Police and fire services are currently adequately funded, Andel commented. Andel said Sartell offers a fine quality of life. “Our family really enjoys the community events Sartell has throughout the year,” he said. Barika Davis, 28, is the vice chairman of the board of STRIDE Academy and also chairs the Academic Excellence Committee at that school. She has lived in Central Minnesota for 10 years and moved to Sartell about a year ago. She is the mother of three children. Davis earned a master’s degree in early-childhood education from St. Cloud State. Formerly, she was a teacher/family advocate for Reach Up Head Start where she worked with low-income students and their families to help close the achievement gap. Davis said her skill set makes her ideal as a council candidate – with skills that include open-mindedness, a willingness to hear and consider different perspectives, good conversation abilities and a knack for engaging people to get a job done. Her knowledge of the city’s comprehensive plan is also a plus, she said. “I understand I do not have all the answers and must utilize the recommendations of city staff and fellow council members to inform my discussions,” she said. Sartell’s greatest strengths she listed as a strong sense of community, local businesses, access to trails, great schools and potential for future development. Those strengths, she said, could be improved by the city keeping residents better informed, by encouraging the public to attend public meetings (such as the parks commission) and by strengthening the collaboration with the school district. Working with developers and the Sartell Chamber of Commerce and city staff to advertise their parcels could help bring new businesses. “I would collaborate with city staff and the chamber to develop a way to attract new growth and development of land parcels,” she said. Another challenge for the city is to make an ongoing effort to create and maintain more trails, as well as water/sewer systems and adding or improving curbs and gutters in many parts of the city. Davis said she does not agree with the location of the Sartell Community Center. The city’s tax rate is the lowest in the area, but Davis added as the city grows, it must meet those needs while ensuring the tax rate is not burdensome to residents. Davis said she likes the idea of developing recreational/aesthetic areas along the river, though she added those areas are limited because most river-front property is privately owned. The paper mill site, however, could be a mixed-use development combining commercial, residential and park space with access to the river and pedestrian bridge. Sartell, she said, does not have a need for a history museum since there is already one for the entire area located in St. Cloud. However, she added, if demand grows for a Sartell museum, a space for that could be added to the community center. Davis said the new Public Safety Building (for police, fire) will greatly enhance the strengths of those departments because of more space for functions, a better location and enough land for future expansion if needed. Davis has a Facebook page at: barikadavisforsartellcitycouncil. For the past eight years, Tim Elness, 52, has been vice president of business development for W. Gohman Construction, St. Joseph. Since joining his father’s architectural firm (ESG Architects) in 1992, he has worked in the construction and development industry. Elness and his wife, Cathy, have three children – Ben, a senior at Sartell High School; Grace, a sophomore at that school; and Lily, an eighth-grader at Sartell Middle School. Born and raised in South Minneapolis, Elness graduated from Washburn High School in 1985, then earned a bachelor’s degree in communications in 1989 from Augsburg College. He has served on the Sartell Planning Commission for the past two years, including involvement on the task force studying the redevelopment of the abandoned Sartell paper mill site. He is also a current member of the Sartell Chamber Board of Directors and a member of the Economic Development Agencies of Minnesota. Elness is an avid volunteer. Prior to moving to Sartell, he volunteered as a special deputy for the Hennepin County Sheriff’s Office Emergency Squad for 11 years. He has also been a volunteer firefighter in Sartell for two years and a member of the National Ski Patrol for 18 years. Qualities that qualify him to be council member, he said, are open-mindedness, an ability to think forward, listening skills, always working with people and a knack for creative ideas and solutions. “I will work to connect our spending with our tax revenue that comes from private development,” he said. Elness said Sartell is strong in its attractive, centrally located and family-oriented city with a great school system. He said the city could use some improvements, however, such as “a core downtown area like traditional small communities,” and also more recreational and aesthetic developments along the river. Elness said the new Sartell Community Center is a great asset that will continue to draw regional fans of all ages for activities that take place there. “As time goes on, I predict uses of the center will continue to expand and add even more value to our community and economic base,” he said. Sartell, Elness said he believes, is taxed appropriately compared with other area cities, even though nobody ever wants to pay more taxes unless absolutely necessary for better roads, school, safety and other city needs. Re-examining tax rates in an ongoing way is vital if the city wants to attract more businesses and residents, he said. Elness said he fully supports a history museum, possibly in a repurposed current building but even a new building would be worth considering, he added. Police and fire needs should be evaluated as the city grows and changes, he said. Elness said there is currently a need for emergency-responder training to help responders become better equipped to deal with calls involving mental-health issues. The new Public Safety Facility is a testament to the support such services have from Sartell residents, and it will make the city safer because such an expanded building is long overdue, he added. Elness said Sartell has a solid infrastructure with so many assets as mentioned above. Jeff Kolb, 49, is an employee of Homeowners Financial Group, a mortgage broker in the St. Cloud area, based out of Scottsdale, Ariz. He is the father of three children – Grant, 26; Megan, 22; Tucker, 14. Born in Melrose, he grew up in the Central Minnesota area and graduated from Milaca High School in 1987. He spent many years in the Cambridge/Isanti area and most recently in Thief River Falls. He moved to Sartell 18 months ago. Kolb has a degree in business management from Bethel College, St. Paul. His work experiences, civic involvement and achievements include the following: Currently a member of the Sartell Economic Development Committee and the Sartell Parks and Recreation Board; he was at one time the owner of a trucking company; began selling real estate in 1997, working in lending; background in finance – banking, bank-branch manager, financial advisor/planner in mortgage issues; and a former member of the Isanti City Council on which he served for four years. He also served that city on the planning commission, other boards and many committees. He was an Isanti firefighter and first responder and a U.S. Navy veteran. Kolb said the biggest challenge for Sartell is proper economic growth. Schools, parks and recreation, churches and businesses are all great assets in Sartell, Kolb said. The city could use more restaurants and entertainment venues, he added. Kolb said he is pleased to hear good things about the new Sartell Community Center, although he added he would prefer it could have been more centrally located in the city. A sheet of ice and/or a swimming facility would be good additions to the center, he said. Kolb said there is a housing shortage in the Sartell area, especially for first-time homebuyers. That lack, he said, must be addressed. Also much needed, he added is more industry with a new industrial park to attract more businesses and industries. City growth, he said, brings the danger of more spending. That must be brought into balance. Kolb would like to see a river-front walk along the Mississippi River similar to the river amenities at Thief River Falls. For the abandoned paper mill site, he would like to see a green technology company placed there, perhaps for solar power, wind power or even expansion of the current hydro-electric facility in that area. Such power generation is now widely done along the Columbia River in Oregon and Washington, he noted. Kolb is in favor of a historical museum in Sartell, perhaps by using an existing building in the city. “Preserving our history is important to our community and the next generations,” he said. Kolb is happy about the police and fire facility now in the planning stages. The city council, he said, must work with those departments to anticipate their needs. “Sartell is already a great city,” Kolb said. “We need to keep it great by continuing to budget properly, plan for short- and long-term growth and listen to the needs of the people. Kolb does not have a campaign website, but he can be reached at 320-266-4044.